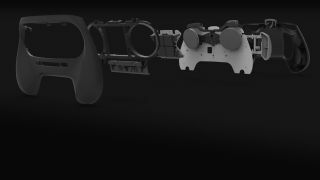 Is this the controller we'll see next year? It's been a couple months since Valve announced it was delaying the release of the Steam Controllers and Steam Machines but it looks like the company has stayed hard at work. While digging through the Steam client beta, a Facepunch user posted what appears to be a new design of the Steam Controller. We've already seen two iterations of the Controller - the first with barely any buttons and no analog sticks, and the second with a more familiar set of buttons and no still stick. However, the latest image shows the addition of a left analog stick in place of the arrow buttons. Having an analog stick makes the Steam Controller look like every other gamepad out there, but it would probably make moving around less unwieldy. It's still not clear how final this design will be, so be wary of impending changes. We've asked Valve to see if this image is indeed the latest mock-up, and will update when we hear back. In the meantime, check out the Alienware Alpha Steam Machine, which is set to release later this year!